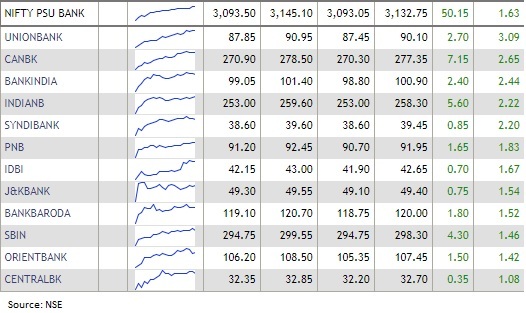 All sectoral indices traded in the green barring IT. Benchmark indices rebounded sharply after falling in previous two straight sessions, driven by banking & financials, and index heavyweight Reliance Industries. The BSE Sensex rallied 424.50 points or 1.12 percent to 38,233.41 and the Nifty50 climbed 129 points or 1.14 percent to 11,483.30. 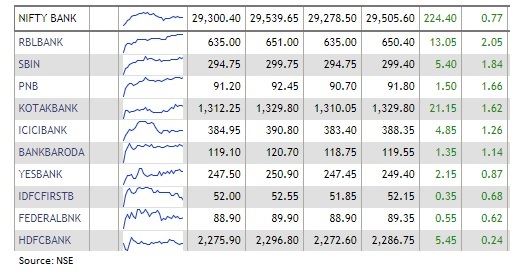 The Nifty Midcap index also gained over a percent but the market breadth was not so great. About 1,377 shares advanced against 1,286 declining shares on the BSE. 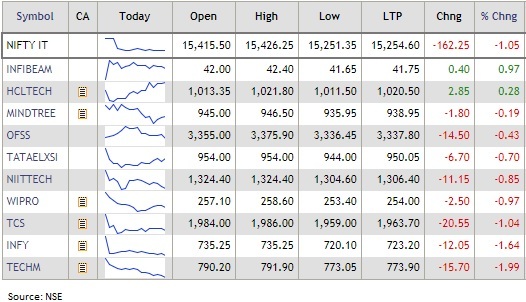 NTPC, Reliance Industries, SBI, Vedanta and Bajaj Finance were leading gainers among Nifty50 stocks, rising 3-4 percent while Tech Mahindra, IOC, UPL, Infosys and Wipro lost 0.6-2.4 percent. SBI Life Insurance Company has declared an interim dividend of Rs 2 per equity share for the financial year 2018-19. Further, the date of payment of the Dividend is fixed on or after April 13, 2019. Benchmark indices extended rally in afternoon with the Sensex gaining nearly 400 points, driven by banking & financials stocks. The BSE Sensex climbed 382.30 points or 1.01 percent to 38,191.21 and the Nifty50 was up 115.50 points or 1.02 percent at 11,469.80. The broader markets also rallied further. 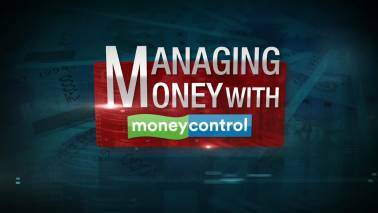 The Nifty Midcap and Smallcap indices gained 1 percent each. HCC said the board of directors approved the proposal for monetisation of an identified pool of arbitration awards & claims (transaction) for which the company today signed terms. Under the terms of the transaction, the company said it would seek to transfer the beneficial interest/rights in a portfolio of identified awards & claims of the Company (Specified Awards & Claims) for a consideration of Rs 1,750 crore to a consortium of Investors led by BlackRock (Investors). A special purpose vehicle (SPV), to be controlled by the Investors, is being setup in this regard, it said. The bond market sent a pre-recession signal on March 22, as the yield on 10-year US Treasury notes slipped 10 basis points to 2.44 percent. Under this Partnership agreement Laurus Labs received and executed the order from Global Fund which would cater to the supplies of the high burden diseases countries in Sub Saharan African (SSA) region. This is the maiden order for Tenofovir/Lamivudine/Dolutegravir 300/300/50mg (TLD) after the Company received a tentative approval from USFDA in the month of February 2019, Laurus said in its filing. The market extended gains amid consolidation in afternoon with the Nifty50 reclaiming 11,400 levels, driven by rally in banking & financials. The BSE Sensex rose 189.27 points to 37,998.18 and the Nifty50 advanced 60.10 points to 11,414.40. SBI Life said the board of directors declared an interim dividend of Rs 2 per share for the financial year 2018-19 on the paid-up equity share capital of the company of the nominal value of Rs 10 each. The interim dividend for Financial Year 2018-19 will be paid to those shareholders whose names appear on the register of nembers of the company or in the records of the depositories as beneficial owners of the shares determined with reference to the record date of April 4, 2019. ACC fell over a percent after LIC reduced its stake in the company by 3.1 percent to 6.7 percent from February 1-March 22, 2019. BLS International announced that it has entered the select club of ‘Fortune India Next 500’ companies. The Next 500 is a comprehensive ranking of India’s outstanding mid-size companies who have carved their way as a shining example of the resilience and entrepreneurial spirit of India which is critical to the economy in terms of its contribution to employment generation and economic growth. MOIL said mine development activities and production (float ore) from new manganese ore mine of the company at Parsoda has been started. Indian shares moderately gained today tracking broader Asian markets after two sessions of losses, as US Treasury yields edged higher, easing concerns about a recession in the world's largest economy. "Domestic markets are well placed, sentiments are still positive, the selloff was mainly because of fears of global slowdown and some correction after last week's rally," said Neeraj Dewan, director, Quantum Securities. Reliance Industries Ltd said its unit Reliance Retail Ltd (RRL) has acquired consumer goods company ITC Ltd's menswear brand John Players. 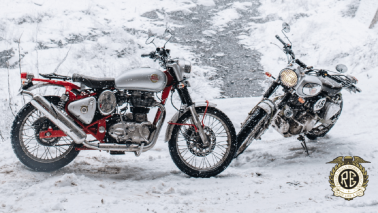 The acquisition would strengthen RRL's readymade garments and accessories portfolio in the fashion and lifestyle retail space, Reliance told Reuters in an email. Reliance Infrastructure, Reliance Capital, Reliance Power and Reliance Home Finance rallied 1-5 percent. Benchmark indices continued to consolidate ahead of expiry of March derivative contracts and after a fall in previous two consecutive sessions. The 30-share BSE Sensex rose 32.72 points to 37,841.63 and the 50-share NSE Nifty gained 12.70 points at 11,367. The Indian rupee is trading higher by 9 paise or 0.13 percent againt the Us dollar at 68.84. Pennar Industries in an exchange filing said by the end of FY19, it plans to take the number of ‘Build 360’ stores to 17 from current 11. The retail stores from the company for building products are branded as ‘Build 360’. Lupin said Lupin Limited and YL Biologics Limited, a joint venture between Lupin’s subsidiary Lupin Atlantis Holdings SA (LAHSA) and Yoshindo Inc. in Japan, has received an approval to manufacture and sell their biosimilar Etanercept in Japan. The approval to treat moderate to severe Rheumatoid Arthritis (RA) and Juvenile Idiopathic Arthritis was received today. Trident Limited has been granted a patent for ‘Environmental Friendly Fabric and its method of Manufacturing’ by the United States Patent & Trademark office. The present invention enables Trident to manufacture fabric for bed & bath products without the use of chemically harmful fibres and at the same time allowing the fabric to be absorbent, easy to dry and highly breathable, the company said in an exchange filing. IT stocks are trading subdued with Nifty IT index down about a percent. Barring HCL Tech and Infibeam, all constituent stocks are trading in the red. ONGC has fixed March 27, 2019 as the record date for the purpose of payment of interim dividend. KNR Constructions has been awarded an order worth of Rs 232.83 crore towards 'Construction of Fly Over at Ramanathapuram and Sungam Junctions in Salem. The project is to be completed within a period of 24 months from the appointed date. 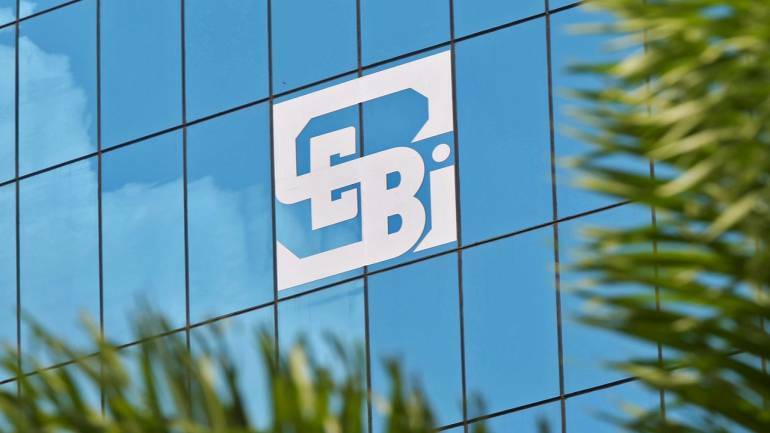 The Security and Exchange Board of India (SEBI) on March 26 asked the Indian stock exchanges to bar foreign portfolio investors who have failed to submit the names of beneficial owners to custodians, a media report said. 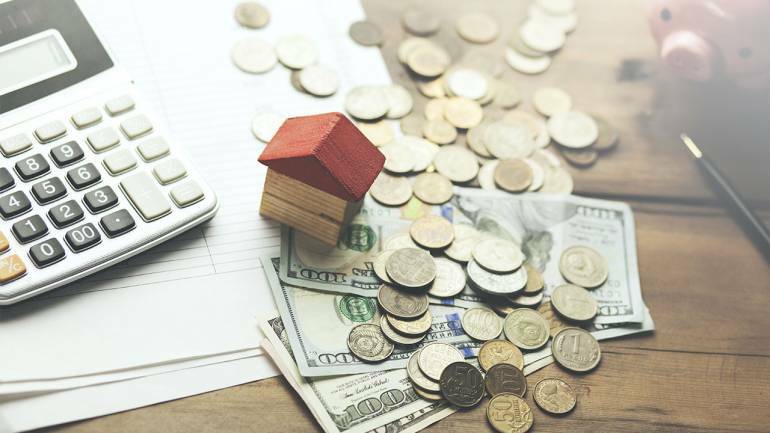 The realty major, on March 25, launched its QIP offer to raise over Rs 3,000 crore by selling 17.3 crore equity shares to qualified institutional investors. With an aim to become a debt-free company, DLF had last year announced plans to issue up to 17.3 crore shares through qualified institutional placement (QIP) to raise funds and pre-pay loans. According to a regulatory filing, DLF has launched its QIP on March 25 and the floor price has been fixed at Rs 193.01 per equity share. Vikas WSP has received approval for export of DP guar gum products for IMC Kelium Potash USA. To confirm final orders a technical expert team of IMC Kelium USA is visiting on April 20, 2019 the plant of the company, it said. It is a newer guar gum product developed by the company during 2016-2017 and now it has been approved for large scale production of potash fertilizers to increase its stability providing better conditioning. Vikas said these orders are expected to execute during financial year 2019-20 (quarter-2, Q-3 and Q4/2019-20).